Should I Display My Wedding Gown? I remember the first time I heard of someone displaying their wedding gown – it was on HGTV. For the life of me I cannot remember the home improvement show, but the newly-married bride wanted a special sitting room designed specifically around her wedding gown that she wanted to showcase on a body form. Immediately this thought popped into my head – how’s the dress going to hold up? 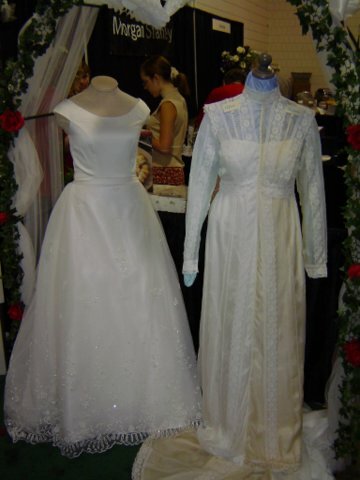 What about displaying your gown in a glass box or a specially designed displayed box? Did you know that the Smithsonian has an extensive collection of first ladies’ gowns, but they are not all on display at once? That’s because their curators and conservators rotate the gowns so that they will remain unspoiled for future generations. Glass cannot stop light from impacting the fibers on a wedding gown; in fact, even a small amount of light can be damaging to fabric fibers. But you still want to be able to see your gown so is shadow box a good option? We know you love your gown, but we want you to be able to share that love with someone else down the road. Take lots of wonderful photos and display them all over your home. And when your big day is behind you, bring your gown to Shores where we will use our multi-step process that promises lasting protection, plus we’ll give you a written, lifetime guarantee against yellowing or caramelized sugar stains on the gown, honored by the Association of Wedding Gown Specialists.